One of the biggest annual retail sales periods is underway, but there's still plenty of time for businesses to ramp up their marketing efforts and in-store retail displays to benefit from the trend. A recent report from discount website Offers.com found that 51.2 percent of all families and adult students begin their back-to-school shopping in August. The second-most common month for consumers to start shopping is in July, when 29.2 percent of those surveyed said they start getting the clothes and supplies that students need for the coming year. A relatively large amount of buyers, 11.7 percent in all, said they wait to do their purchasing until their kids have already gone back to school or at other points during the year. The spread of purchasing obviously has something to do with when school starts in different parts of the country, as there is more than a month of difference between the earliest and latest outliers on the public school schedule. Differing college start times further spread out purchasing, and retailers need to remember that college students aren't just buying supplies and clothes, but are often completely or at least partially furnishing their living spaces as well. In fact, even supermarkets and hardware stores get involved in the back-to-school season for older students in their own residences. The back-to-school market is vast in terms of age ranges and preferences, so the majority of retailers can get involved to some extent. The most important component of getting the attention of in-store visitors is effective visual merchandising. 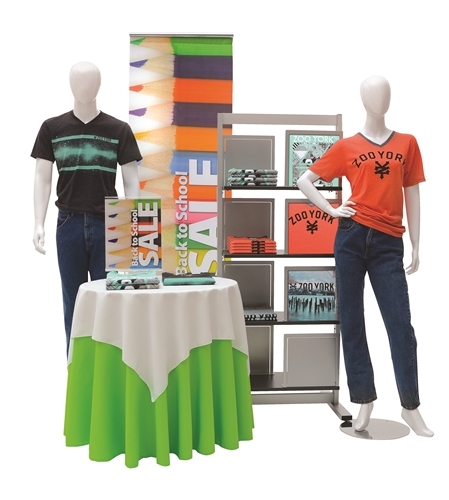 Whether using movable pieces such as display tables and mannequins or less-mobile store display fixtures, a good presentation sets the stage for interaction with products and, through that, purchasing. This period is an especially good time to invest in retail display items, because they can be utilized immediately in stores and then put to work soon after for the winter holiday season – which can stretch to the beginning of November, if not earlier in some markets. Without attractive displays, businesses will lose out on some measure of sales and see those go to their local competitors. The one-time investment into retail fixtures will continue to pay off for companies as they use them throughout the year.